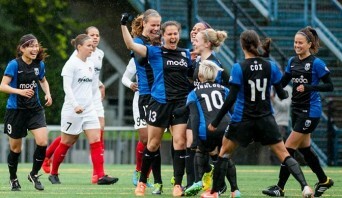 Seattle Reign FC sits alone atop the National Women’s Soccer League (NWSL) standings after notching their second win of the young season, a 3-1 win over Washington. In front 1,750 fans at Moda Health Pitch at Memorial Stadium in Seattle, the Reign struck early and continued with a relentless attack to down the visiting Spirit. Defender Kendall Fletcher set the tone early, scoring at the 3′ mark off an assist from Jess Fishlock. Despite numerous shots on goal by U.S. Women’s National Team forward Sydney Leroux and midfielder Bev Goebel, Washington remained down by just the one goal going into the half. Seattle notched the insurance goal early in the second half when midfielder Keelin Winters converted on a corner kick from Nahomi “Naho” Kawasumi. Washington made a game of it at the 73′ mark when Fletcher was called for a handball inside the penalty box. Diana Matheson took the penalty kick for Washington, pulling her team within one goal. The Reign sealed the win when midfielder Jess Fishlock snuck past the front post to notch a goal into the far left corner in the 80th minute. At 2-0-0, Seattle is the only team to have won two games at this point. Portland Thorns FC and Sky Blue FC also remain undefeated, but have played to one or more draws at this point. In their next contest, Seattle hosts the Houston Dash (1-1-0) Sunday, April 27, at 7pm. Posted April 25th, 2014 & filed under Sports.